CARSON, Calif. – Behind a strong defensive performance and a second-half finish from forward Fanendo Adi, the Portland Timbers earned a hard-fought road point against the LA Galaxy with a 1-1 draw before 25,667 fans at the StubHub Center on Sunday evening. With the draw, the Timbers (1-2-2, 5pts) have earned at least one point in four of their last six road games against the Galaxy at the StubHub Center since 2013. It also marked just the third time the Galaxy have failed to win at home in their last 12 matches, with two of those three contests occurring against the Timbers, including a 5-2 Portland victory on October 18, 2015. Overall, the Timbers have lost just twice in their last 10 regular-season meetings with the Galaxy. 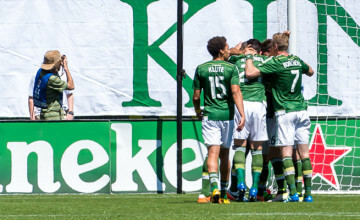 After a scoreless first half, Portland opened the second half on the strong foot when Adi produced a well-placed finish into the bottom, right corner to provide the Timbers with a 1-0 advantage in the 52nd minute of play. Portland’s goal, which places Adi in a tie for first place in MLS for goals (4), occurred on a quick counter-attack play, with midfielder Diego Valeri playing the ball down the left flank to Adi, who cut inside the box and curled his effort into the back of the net. The Timbers, who entered the match leading MLS in chances created (62), added to their tally in Sunday’s match with several additional opportunities to find the back of the net. In the 21st minute of play, a crafty combination play by Portland in the midfield created space on the right wing for Valeri, who fired a cross into the six-yard box that narrowly eluded midfielder Lucas Melano’s sliding effort. 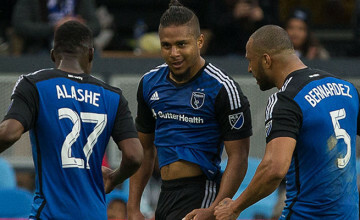 In the second half, Melano collected a loose ball in the midfield before firing a powerful shot that went just high of the target in the 50th minute of play, while Adi came close to securing a brace in the 83rd minute after dribbling by two Galaxy defenders before attempting to lob the ball over goalkeeper Brian Rowe from inside the 18-yard box. On the defensive end, the Timbers recorded 15 successful tackles, four more than the Galaxy, along with four saves made by goalkeeper Adam Kwarasey. In the 56th minute, Kwarasey reacted quickly to parry away a header from the Galaxy in the box, before charging off his line one minute later to punch away a threatening corner kick from the Galaxy to prevent the home team from finding the back of the net. But, with seven minutes remaining in the game, the Galaxy (2-1-2, 8pts), who were limited to four shots on target throughout the match, managed to equalize when a cross into the box deflected off defender Nat Borchers, who was attempting to head the danger away, and into the net. Next up, the Timbers will return to Providence Park to take on FC Dallas on Wednesday, April 13. Wednesday’s match will be broadcast live on ROOT SPORTS with local radio broadcasts on 750 AM/102.9 FM The Game (English) and La GranD 1150 AM/93.5 FM (Spanish); kickoff is set for 7:30 p.m. (Pacific).